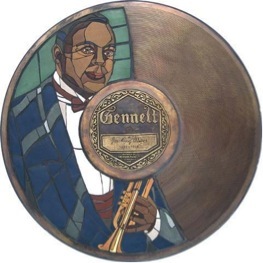 April 6th in Gennett History, 1923: King Oliver’s Creole Jazz Band recorded ten sides in Richmond, including “Chimes Blues,” “Canal Street Blues,” and “Dippermouth Blues.” The band featured King Oliver and Louis Armstrong (c), Honore Dutrey (tb), Johnny Dodds (cl), Lil Hardin Armstrong (p), Bill Johnson (bjo), and Baby Dodds (d). They appeared on Gennett 5132, 5133, 5134, 5135, and 5184. Video | This entry was posted in April, Gennett, Gennett Walk of Fame, Video and tagged April, Baby Dodds, Bill Johnson, Canal Street Blues, Chimes Blues, Dippermouth Blues, Gennett, Gennett 5132, Gennett 5133, Gennett 5134, Gennett 5135, Gennett 5184, Gennett Discography, Gennett Records, Gennett Walk of Fame, Honoré Dutrey, Joe "King" Oliver, Johnny Dodds, King Oliver, King Oliver's Creole Jazz Band, Lil Hardin, Lil Hardin Armstrong, Louis Armstrong. Bookmark the permalink.